Arlette Farge and Michel Foucault, The Disorder of Families [Le Désordre des Familles] will appear in fall 2016 with University of Minnesota Press. Nancy Luxon is editing the text, and her website says there will be a companion scholarly volume – also announced in the recent seminar on Lectures on the Will to Know at Columbia. Jeremy Crampton alerted people to this a while back, but the book now has a more definite date. 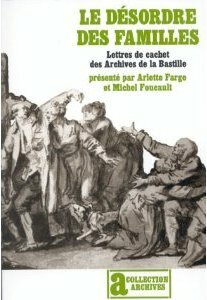 There is a short discussion of the project that led to this book, which has its roots back in the late 1950s, in Chapter Eight of Foucault’s Last Decade. This entry was posted in Arlette Farge, Michel Foucault and tagged Nancy Luxon. Bookmark the permalink. I will be looking forward to this with great enthusiasm!